Like many teams, the Houston Rockets have set their sights on New York Knicks forward Carmelo Anthony in free agency. Although Melo has seen his fair share of criticism over his career, he's a legitimate All-Star with unique scoring ability and skills varied enough to allow him to succeed in several different systems. Players of this quality don't come on the market very often, and the Rockets have decided that he's worth convincing with a great deal of effort and wooing. Houston pre-informed Jeremy Lin of the use of his No. 7 on 'Melo recruiting images, source tells Yahoo Sports. If 'Melo comes, Lin has to go in a trade -- which Lin's aware. Given 'Melo-Lin history, understandable why Lin would be sensitive about it. Spoke to Lin's agents, Jim Tanner/Roger Montgomery, who say that Houston did NOT inform Lin that the No. 7 would be used for Melo images. Lin would in fact need to go in the event that Anthony joins the Rockets — taking his $8.37 million off the books would allow the Rockets to sign Anthony to a max contract, and the team reportedly did not include his name in a list of teammates featured in a presentation to the prized free agent. Such moves are always possible in a league with as much player movement as the NBA, and Lin would certainly know that this development could occur. Some reports suggest that a trade could already be in place in the event that the Rockets get Anthony. Yet the possibility of a deal does not absolve that player's employer of treating him poorly. 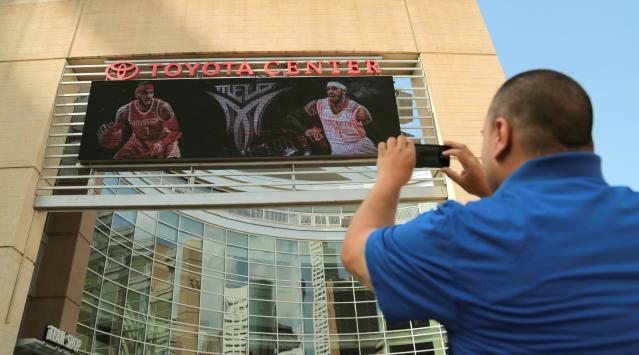 The Rockets' pursuit of Melo certainly does not guarantee that they'll get him — in fact, it could be a longshot. If they don't get him and Lin isn't dealt in a separate move, then they'll need to explain why they thought it was fine to act as if he were no longer a part of the team even as he remained under contract. That decision signals that the franchise doesn't value Lin's contributions enough to take his point of view into consideration. It's a sign of both professional and personal disrespect. Plus, as noted by Woj, the use of No. 7 must hurt Lin especially because it involves Carmelo Anthony. The two players had an uneasy relationship as teammates with the Knicks in the 2011-12 season, with Melo later blaming the "Linsanity" phenomenon for contributing to his reputation as a selfish player. Anthony also referred to Lin's Rockets offer sheet that offseason as a "ridiculous contract," although he eventually said that he wanted the point guard back with the franchise. Whatever the true substance of their relationship, it's clear that the players don't get along especially well and have preexisting issues related to their own popularity. The Rockets ignored this history, apparently assuming that they would be able to reset relations with Lin in the event that things don't work out with Melo. It's an approach that treats Lin not so much as an employee in partnership with the franchise than as a mercenary contracted for a particular task. While the latter may be true in terms of cold contractual language, it's far from the only factor in a sports world where loyalty and family bonds are spoken of as principles that contribute to success. When a player is spoken of as an "asset," he becomes a commodity rather than a person. Any NBA player must know that he could be moved to another team at any time — it's part of the business. However, at a very basic level, they still want to be treated with respect. It's a point worth keeping in mind the next time a Rockets executive — or one from any team, really — demands that a player show his loyalty to his team. These relationships must go both ways if they are to mean anything.